When Andrew checked into hospital just before Christmas 1997 he had more on his mind than the imminent removal of his four wisdom teeth. "I had never been in hospital before," he explains. "We had just finished filming the first week of All Saints and I wanted to observe all the hospital procedures. "It was a really weird experience being wheeled into the operating theatre. I was trying to sit up and see everything and they were saying. 'Lie down, lie down.'" Since Andrew's character is a psychiatrist, not a surgeon, he was more interested in the nuances of how the hospital staff work together and how it feels to be a patient. Growing up in Melbourne, Andrew was a talented sportsman. He began studying music and acting, and as the work became more frequent he decided to concentrate on acting. "I started getting work on all the Crawfords shows and, looking back, I think one of my first claims to fame was working on The Sullivans," he says. "I played a sailor who was a love interest for Kitty but also facing a court martial for cowardice. Luckily, Mel Gibson was playing 'my' defence lawyer and he got me off the charges." Andrew's first ongoing series roles were Skyways and Sons and Daughters. Throughout the 1970s and '80s he worked on the Paul Hogan Show, Special Squad and Carson's Law. In 1986, Andrew decided to go to the United States to check out opportunities. "I was there for about seven or eight months, had no work permit and was down to about $30 in my pocket and half an apple in the 'fridge," he says. Then he landed a role on the telemovie The Facts of Life Down Under, which meant a job and a first-class ticket back to Australia for the shoot. Andrew played the lead role in the mini-series Dusty before heading over to the US again. In Los Angeles, he worked in a variety of jobs including television production assistant and scuba shop manager while continuing to audition and perform in various projects. He had a guest stint on Days of Our Lives but his favourite experience was playing D'Artagnon in the telemovie Zorro (The Three Musketeers). The movie was shot on location in Spain with plenty of swashbuckling and swordfighting scenes. 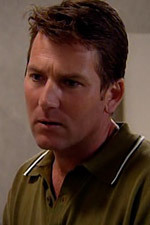 Andrew returned to Australia in 1993 for a lead role on the series Paradise Beach. He says it was great coming back to a regular role. And, after a couple of years in LA, the clean water and clean beaches of the Gold Coast were fantastic. Over the past few years he has worked on Fire, Law of the Land, The Man from Snowy River, Blue Heelers, Flipper, The Violent Earth, Tales of the South Seas, Neighbours, Medivac and the CBS telemovie The Tanker Incident, co-starring with Patrick Duffy. Andrew says he loved the All Saints script when he first read it. 'I was in tears thinking about the character of the cancer patient in the first episode,' he says. "I was also taken with my character. Peter is a warm, caring person, a listening person, and there has been plenty of scope for him to develop." Away from the set, Andrew enjoys running, golf and music. He also plays with country rock band The Fine Line, in which he is the main singer/songwriter and plays rhythm guitar. He has been playing guitar since he was about nine and writing songs for many years. In 1994, he won second place for Best Song in the Country Category of the Australian Songwriter's Association, and in 1995 he was a finalist in the Amateur Category of the Tamworth Music Festival. At the inaugural Roots Music Festival, in Victoria, The Fine Line was a finalist in the Band of the Year category and the album 'think they are but are' was a finalist for Best Album. The Fine Line landed the support spot for Keith Urban at the 1999 Tamworth Country Music Festival. Peter was the Hospital's top Surgical Intern but he was not interested in delving into people's guts... he was more interested in their minds. Now he is the Senior Registrar of the Psychiatry Unit. He could have gone into private practice and earned squillions years ago but he would have hated it. Instead, he prefers to wallow in the flotsam and jetsam that floats through the doors into All Saints Hospital: the attempted suicides, the addicts, the casualties of the social system or chronic illness, the manic depressives and the just plain mad. They are Peter's and he wants to help. Peter epitomises what the world wants to think doctors are like. He is dedicated and loves his work, spending long hours in the hospital. Naturally, all these things made him a lousy marriage partner. He did not mean to be: he loved his wife and kids but they often came a poor second to his work. Although frustrated by his addiction to his work, his family was tolerant. When Peter's wife Jenny was fatally injured in a car accident he had to reorganise his life to spend more time with the children to help them and himself through the grieving period, but it has not been easy. As a Psychiatric Registrar, Peter has many duties. His department must see every attempted suicide before discharge, he runs an outpatient clinic and patients are referred to him from every unit in the hospital for a wide variety of reasons. Therefore he must have a broad knowledge of the physical as well as the psychological. Psychiatrists are usually mistrusted and treated with suspicion by the more traditional medical and surgical units, and Peter does not help by poking his nose in where other people do not want it. His holistic approach to pain management in particular draws him into conflict but his patients and most of his colleagues, Terri in particular, think he is terrific.